Livingston increased their lead over Championship bottom club Alloa Athletic by inflicting only Falkirk's second home league defeat of the season. Second-half goals from Jordan White and Sam Stanton put the visitors in front in their fight for survival. They had to endure a Falkirk fightback, Will Vaulks pulling a late goal back. Livingston goalkeeper Marc McCallum was the hero of the win, though, saving John Baird's last-gasp penalty to secure the victory. Falkirk might have thought they could win the game through persistence alone. They were the dominant side from the outset, and their sprightliness was a constant challenge to the order Livingston were trying to impose with their defensive shape. Peter Houston's side almost took advantage early on, with Vaulks heading over, then Bob McHugh outmuscled Jackson Longridge only for his shot from an angle to be cleared off the line by Ben Gordon. Livingston were only sporadically threatening, but were still capable of troubling Deniz Dogan Mehmet, the goalkeeper in the starting line-up with first-choice Danny Rogers away on Republic of Ireland Under-21 duty. Livi's organisation and application were capable of thwarting Falkirk. For the rest of the opening half, the home side were restricted to long-range efforts - Aaron Muirhead seeing his effort saved by McCallum and Vaulks lashing a shot off the top of the bar. With Darren Cole strong and aggressive at centre-back, Livingston were well served in defence. They had to rely on wastefulness from Falkirk, though, since Baird twice should have scored, skewing a header wide and then steering a volley past - both from close range. Livingston were resourceful in defence, but they were able to bring that to their attacking play in the second half. They became more prominent in the opposition half, and that resulted in Liam Buchanan busting into a pocket of space inside the area to provide the cross for White's conversion. The tall striker almost added a second when he picked his way through the Falkirk defence only to be stopped by Mehmet's excellent one-handed save. The more that Falkirk pushed forward, the more threatening Livingston were even in the closing stages. Stanton, a second-half substitute, showed neat footwork to make space for a shot from 20 yards he steered it past Mehmet. That seemed certain to deliver the victory, only for Vaulks to score with a header. Then Falkirk won a penalty when Longridge fouled Lee Miller. The Livingston defender was dismissed for his second yellow card, but McCallum was equal to Baird's penalty. Match ends, Falkirk 1, Livingston 2. 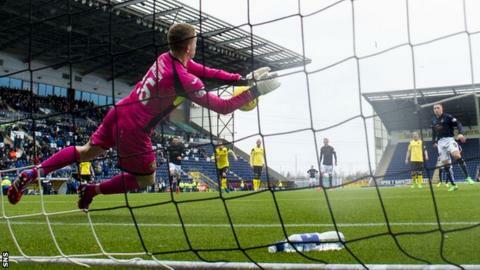 Second Half ends, Falkirk 1, Livingston 2. Attempt missed. Luke Leahy (Falkirk) right footed shot from the right side of the six yard box is just a bit too high. Penalty saved! John Baird (Falkirk) fails to capitalise on this great opportunity, right footed shot saved in the top centre of the goal. Penalty Falkirk. Lee Miller draws a foul in the penalty area. Second yellow card to Jackson Longridge (Livingston) for a bad foul. Penalty conceded by Jackson Longridge (Livingston) after a foul in the penalty area. Goal! Falkirk 1, Livingston 2. Will Vaulks (Falkirk) header from the centre of the box to the bottom right corner. Assisted by Lee Miller. Corner, Falkirk. Conceded by Marc McCallum. Attempt saved. Will Vaulks (Falkirk) right footed shot from outside the box is saved in the bottom right corner. Goal! Falkirk 0, Livingston 2. Samuel Stanton (Livingston) left footed shot from outside the box to the bottom right corner. Assisted by Mark Fotheringham. Attempt missed. Luke Leahy (Falkirk) right footed shot from the centre of the box misses to the right. Myles Hippolyte (Falkirk) wins a free kick on the left wing. Foul by Samuel Stanton (Livingston). Lee Miller (Falkirk) wins a free kick in the attacking half. Attempt missed. Scott Pittman (Livingston) left footed shot from the centre of the box is close, but misses to the right. Attempt blocked. John Baird (Falkirk) right footed shot from outside the box is blocked. Foul by Darren Cole (Livingston). Attempt saved. Jordan White (Livingston) left footed shot from the centre of the box is saved in the top centre of the goal. Darren Cole (Livingston) is shown the yellow card for a bad foul. Substitution, Livingston. Morgyn Neill replaces Liam Buchanan. Goal! Falkirk 0, Livingston 1. Jordan White (Livingston) left footed shot from the centre of the box to the bottom left corner. Assisted by Liam Buchanan. Attempt blocked. Craig Sibbald (Falkirk) right footed shot from the right side of the six yard box is blocked. Jordyn Sheerin (Livingston) is shown the yellow card for a bad foul. Will Vaulks (Falkirk) wins a free kick in the attacking half. Foul by Jordyn Sheerin (Livingston). Corner, Livingston. Conceded by Paul Watson. Attempt blocked. Liam Buchanan (Livingston) left footed shot from the left side of the box is blocked. Attempt missed. John Baird (Falkirk) right footed shot from outside the box is high and wide to the right.